Obama’s Health Reform: Tax. Spend. Regulate. Mandate. The much-awaited health-care reform plan the White House released this morning is little more than an amalgamation of the taxing, spending, mandating, and regulating policies of the bills that passed the House and Senate last year. Instead of offering a genuinely fresh approach, Mr. Obama split the difference between two bad bills that are hugely unpopular with the American people. He would continue to mandate that both individuals and employers pay for health insurance or face fines and penalties. He would expand Medicaid, the most dysfunctional health program in the country. And he would increase fees on insurers and other health companies — fees that will be passed along to consumers in the form of higher premiums. The big new idea in the president’s plan is to federalize regulation of health insurance, creating a Health Insurance Rate Authority to conduct “reviews of unreasonable rate increases and other unfair practices of insurance plans.” This reflects the overall strategy to give more and more control over the health sector to Washington. Mr. Obama clearly is not trying to bridge the divide between Republicans and Democrats as a starting point for a dialogue at the summit on Thursday. A separate document listing Republican ideas he would include focuses almost exclusively on policies to crack down on waste, fraud, and abuse — good ideas, but not enough. In fact, the Obama plan snubs the GOP by calling for increased taxes on companies inside and outside the health sector, and for slapping a payroll tax on the non-wage interest and dividend income of wealthier Americans. These higher taxes will drive up the cost of health insurance, depress innovation, and delay the economic recovery. The way the president has dealt with the Cornhusker Kickback, the Louisiana Purchase, and the labor-union exemption is to basically extend the sweetheart deals to others. All states get more favored treatment for expanding Medicaid, and the threshold for taxing high-cost health plans is raised, while the tax will not take effect until 2018. The proposal that the president has outlined will cost even more than the Senate bill. It will lead to exploding costs that will surely top the Senate bill’s $2.5 trillion over 10 years. Health spending will continue to rise, premium costs will increase, at least 24 million people will remain uninsured, and the system of subsidies to individuals and businesses will continue to allow politicians to pick winners and losers. Moreover, because the president’s plan is built upon the Senate bill, it would include cuts to Medicare that will jeopardize care for seniors. The Obama plan is not an improvement, and it offers Republicans little upon which to build a conversation that could lead to genuine compromise at Thursday’s summit. 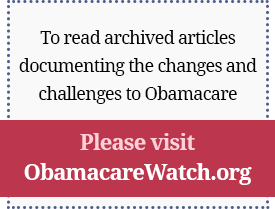 Previous Article: Obama’s Health Reform: Tax. Spend. Regulate. Mandate. Next Article: Obama’s Health Reform: Tax. Spend. Regulate. Mandate.